EAST NORTHPORT, NY — Connolly Music, the leading U.S. source for world-class music products, recently acquired boutique company Magic Rosin, contributing to its line-up of distinctive orchestral music products. 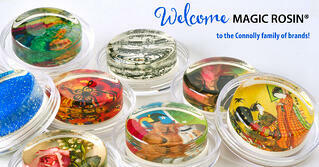 Magic Rosin is premium rosin used for violin, viola, cello, and bass. Formulated from premium grade pure pine resins, Magic Rosin provides superior grip for a clean, complex tone desired by professional musicians and students alike. The rosin comes in two formulas – 3G and Ultra – both provide a tremendous grip, with Ultra delivering the strongest grade of grip. Magic Rosin also produces minimal dust and has no hidden ingredients that can be hazardous to instruments and players. Magic Rosin was invented and developed by professional cellist and teacher Sarah West in 2010. From her Minneapolis home, West hand-poured all Magic Rosin at home until spring of 2012, when she moved production to a small commercial workshop. Her search for a grippier-than-average rosin led her to develop formulas that have an almost transparent appearance. While the formulas West developed are professional-grade, they created a whole new concept — visual rosin. “I come from an artistic background and spent years making glass beads,” stated West. “When I realized the formula was almost clear, creating designs for the rosin was really fun and a natural development." Currently, Magic Rosin has more than 70 fun and attractive designs, from sparkles and holograms to art and animal images, and even a glow-in-the-dark rosin. Ordering custom rosin designs is also available with school or orchestra logos as well as favorite images – which make great gifts or souvenirs. Connolly Music Company is the U.S. source for world-class music products including Thomastik-Infeld strings, König & Meyer stands, Revelle instruments and accessories, The Realist products by David Gage, Faith Guitars – and, most recently, Magic Rosin. A family company, celebrating more than 45 years in business, Connolly is dedicated to connecting manufacturers, resellers, and the devoted community of musicians they serve.